Are you looking for practical, holistic, real-life solutions for healthier living? 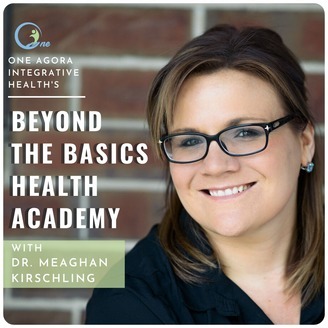 Join Dr. Meaghan Kirschling for real life education as she discusses and explores topics that affect your everyday living. Learn how balanced eating can increase energy, stabilize moods, jumpstart metabolism, eliminate cravings, restore digestion and decrease inflammation. 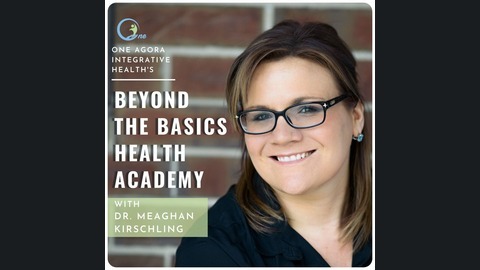 Dr. Meaghan fields questions from listeners and brings in expert guests for a lively discussion about nutrition, supplements, holistic health, integrative medicine and the latest research. Join the Academy for the University of You. Beyond the Basics Health Academy is excited to be back and there is no better topic to discuss after a little hiatus than thyroid and how the thyroid works. So many individuals struggle with thyroid concerns but are told that they have a normal thyroid gland. Dr. Eric Balcavage DC, CNS, CFMP, BCIM joins us to tackle this issue and explain exactly how the thyroid works and why we need comprehensive testing. Dr Eric Balcavage is the owner and founder of Rejuvagen, a functional and regenerative medicine clinic in Glen Mills, PA. He is nationally recognized speaker and educator on various health related topics including thyroid physiology, bile physiology, detoxification, oxidative stress, methylation and chronic illness. He has been in private practice in Glen Mills, PA since 1996. Dr. Balcavage is a Certified Nutrition Specialist (C.N.S. ), a Certified Functional Medicine Practitioner, Board Certified in Integrative Medicine, along with being a licensed Chiropractor in Pennsylvania. Dr. Balcavage is the co-host of Thyroid Answers Podcast. The podcast focuses on answering the pressing questions those suffering with chronic hypothyroid symptoms can’t get answered elsewhere. You can find his educational Thyroid Thursday videos on Vimeo and Youtube. Dr Balcavage has made it his mission to change the way medicine looks at hypothyroidism. He is currently working on a book that will address the problems with current allopathic and functional medicine approaches to hypothyroidism as well as the solutions to restoring thyroid physiology. Thanks so much everyone for listening! Reach out to us at info@btbha.com with any questions, comments, or topics for future podcasts. And remember to be kind to others, take care of yourself and make good choices.